Photo is of, from left, T. Marie King, Dr. Bertha Hidalgo, Khaula Hadeed and Richard Friedman. I couldn’t agree more with her. 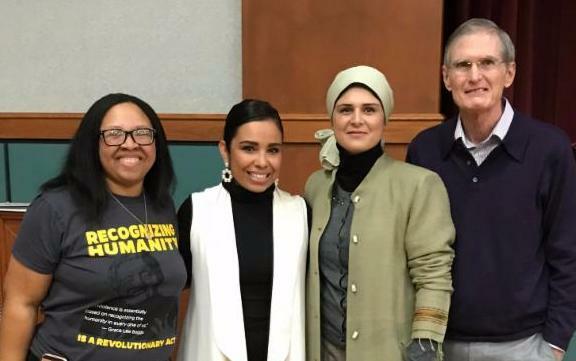 That night, the Birmingham Jewish Federation and the Levite Jewish Community Center co-hosted a program entitled “Unchaining A Changing Birmingham,” which addressed challenges that the Jewish, African-American, Latino/Hispanic and Muslim communities face in Birmingham. Each representative of the different communities spoke from the heart, explaining some of the difficulties their community faces. While as Jews, we are considered a minority, we “blend in” with the rest of the world. Our skin color doesn’t make us stand out and we don’t have a language barrier. But that isn’t true for the other groups represented at the program. Some of the challenges they face, which were discussed throughout the program, were really eye opening. The moderator Melanie Bridgeforth, who is the Executive Director of VOICES for Alabama’s Children, framed the conversation beautifully and asked the panelists to dig deep, addressing topics that are sensitive and pushing the panelists to be vulnerable. Dr. Bertha Hidalgo, a Stanford graduate and member of the University of Alabama at Birmingham faculty who represented the Latino/Hispanic community, explained that she often gets asked about her immigration status, even though she’s lived in the US her entire life. As someone who does research on the Latino population and is Hispanic herself, she is clued in to the challenges and barriers that her community faces. “I don’t have an accent and I may not look as ‘Mexican’ as others, but if I am experiencing these types of comments and ignorant remarks, I can only imagine what the rest of my community feels,” she explained. What was most important about the event, to me, was that it wasn’t just a discussion of problems. At the end, Melanie asked T. Marie King, the African-American representative, to describe some ways that we can all move forward together. T. Marie had a list of suggestions, including working to understand differing perspectives. “You may not agree with the person sitting beside you, but you need to be able to understand where they are coming from,” she said. And BJF-LJCC Executive Director Richard Friedman, who represented the Jewish community, added to the ways we can move forward by giving an example of a conversation he had with the Muslim representative, Khaula Hadeed. He explained that, in general, the Muslim and Jewish community have differing perspectives on the Middle East and it is often a hot button issue for both communities. So, when navigating a relationship between the Jewish and Muslim communities, Richard said that he’d always had trouble with this one issue. Since then, Khaula has spoken to students at the N.E. Miles Jewish Day School about her life as a Muslim and been a resource to the Jewish community in further building a relationship with the Muslim community. Here is what I believe it all comes down to: We may have differing perspectives or opinions that are all valid, but we have to put some of that aside to live in this world together. The evening was an important reminder of the bridge building that the BJF and LJCC do with the broader community. There are so many challenges to address, but only when we understand the issues others are facing is when we can truly move forward and create a better Birmingham. If you missed the event, don’t worry. We’ll be doing a similar event in the near future because, as each of the panelists agreed after the program, this conversation is too important to not continue. Click for more on the Levite Jewish Community Center.